No need to decide on a favorite color scheme with this weekly calendar by German designer Peter von Freyhold, because it has a different hue for every day. 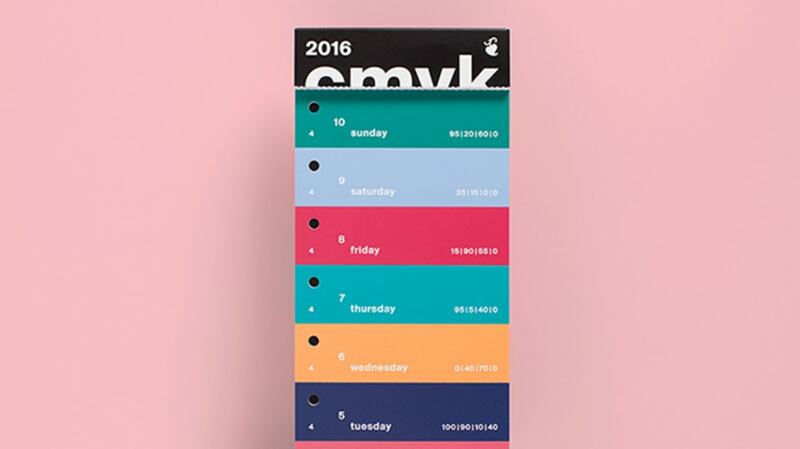 Each date has its own CMYK color, so that as the days pass and you tear them off, the calendar changes colors. CMYK is a model used in color printing, named after the four ink colors it uses (cyan, magenta, yellow, and key, or black), and each date is labeled with its precise CMYK data, so you know exactly what percentage of each of the four colors creates sea foam green or mustard yellow or hunter green. It comes with a case and book binding screws so that you can collect all the stripes together once those days have passed. At the end of the year, you'll have a pile of colors to reference when looking for that perfect shade. Buy it on Amazon for $49.